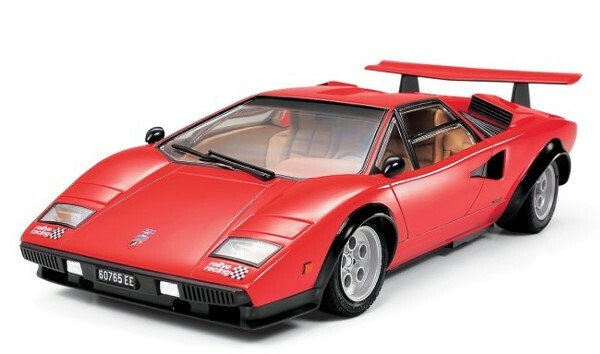 Following on the heels of the recently announced ITEM 24305 Lamborghini Countach LP400 isthe LP500S version. Styled by Marcello Gandini of the Bertone design studio, the Lamborghini Countach is one of the most widely-recognized super cars in the world. It's low wedge-shaped body styling inspired the design of many super cars after it and its trademark upward-tilting door design is still quite popular today. The first production Countachs were equipped with a mid-mounted longitudinalV12 engine with 4 liter displacement, hence the LP400 designation. Not satisfied with the stock engine, Canadian industrial magnate Walter Wolf had a Countach customized to his specifications with a more powerful 5 liter V12 engine. Futuristic wedge-shaped body accurately reproduced complete with rear wing and widened fenders. Engine hood can be opened to reveal engine bay. Headlights that can be modeled in either up or down positions. Synthetic rubber tires feature realistic tread pattern.